Dr. ir. 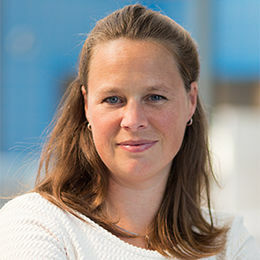 Maaike Kleinsmann is Associate Professor in design-driven innovation within the Management and Organisation Research Group of the IDE faculty. She has over fifteen years of experience with research projects on collaborative design and design thinking in innovation (networks). As a researcher, Kleinsmann has been involved in various innovation projects from the 2000s onwards. These projects vary from the development of a high-speed train to product-service systems for people suffering from dementia. Her role in these projects has also differed greatly, from a lonely observer making sense of the effectiveness of collaborations to a team member actively involved in the development of products and services. Designing has always been the thread that joins all her projects together. Kleinsmann’s current research focuses on the role of design thinking in digital innovation in healthcare aiming to develop and test methods that equip industrial designers to innovate within a connected world – a world in which value is created not only by innovators, but also by everyday people. She published her work in leading design journals and recently published the book ‘Images of Design Thinking’. Moreover, Kleinsmann has ample experience with organizing and coordinating a consortium of public private partners. She was project leader of the IOP/IPCR project entitled: “A designerly approach to networked innovation”. Currently, she is one of the partners in an NWO project entitled: “Cross-over collaboration for digital innovation”. Kleinsmann is also the head of the Cardiology Lab which is an initiative of The Faculty of Industrial Design Engineering, De Hartstichting and Philips Design. Within the lab, researchers, designers and students collaboratively develop solutions that support cardiac patients to live a longer and healthier life. Delft University of Technology, Faculty of Industrial Design Engineering, Degree: Ph.D.
NWO project entitled: Cross-over collaboration for digital innovation. This project is a collaboration between the PIM department of the IDE faculty and the KIN research group of the VU Amsterdam. Cardio Lab: This is an initiative of The Faculty of Industrial Design Engineering, De Hartstichting and Philips Design. Within the lab, researchers, designers and students collaboratively develop solutions that support cardiac patients to live a longer and healthier life.